It's always hard to read a super-hyped novel. I find that only a rare few live up to everyone's heightened expectations. 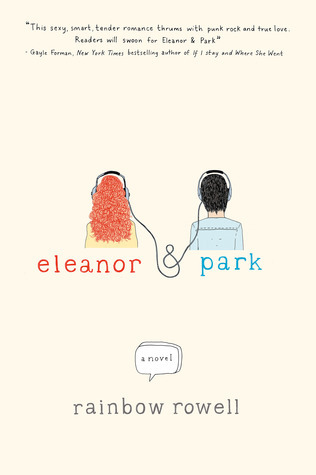 It seems like everyone and their sister has been raving about Eleanor & Park. I put off reading largely out of nervousness that it couldn't stand up to Amy's other titles which I loved. Lucky for me, Eleanor & Park was just as wonderful as everyone said. The book sets itself apart by its setting: Omaha in 1986. That was the year I started kindergarten. I was 4 years old for most of the year, so I remember virtually nothing. But since I was old enough to read TV and started middle school in 1992, I have a decent awareness of the 1980s culture. This was a fun mixture of nostalgia and history for me. I didn't exactly live it, but it felt very familiar. I wonder how readers ten or more years younger than me would react. Part of what made this book so unique is just that: it's unique. Rainbow Rowell appears to have consciously steered clear of every YA romance trope. There's no insta-love or even insta-hate: mostly reluctance and suspicion. The characters are unremarkable. You even know from the first page that there isn't going to be an entirely happy ending. As I said above, Eleanor & Park are not remarkable. Eleanor is introduced explicitly as not being pretty. She is overweight with big red hair and a generally morose disposition. Park is average. Neither of them are exceptionally intelligent, wealthy, kind, funny, or talented in any way. They are average teenagers. And that made this book better. Most of us are not as cool as the protagonists in YA novels. We can imagine ourselves as Eleanor and Park, both of whom are three dimensional, flawed people. Eleanor trusts no one. Her horrific stepfather and downtrodden mother have given her reason to distrust. She comes off as unpleasant, but seeing the world through her narration, we learn that she is really scared and vulnerable. Park is a nice kid, but not overly nice. When Eleanor is the new kid on the bus who dresses weird, Park doesn't want anything to do with her. He is too afraid of being shunned by his peers. Not the ideal reaction, but a very real one. One YA trope that Eleanor & Park does fulfill is angst. There's so much angst in E&P's growing relationship. Thankfully, the angst entirely fits their characters and the situation. Mostly there are no big tragedies that put roadblocks in their way. It's more like little misunderstandings or teenage insecurities. Very much like a real romance would struggle to survive. Eleanor & Park really is a stand-out novel. It hits every note of a teenage romance with all its ups and downs, without feeling melodramatic. Eleanor and Park are characters you come to love and care for, despite their flaws. Unlike many readers, though, I preferred Fangirl over Eleanor & Park. I think they're of equal quality, but I identify with Fangirl a little bit more. It definitely says something about Rainbow's skill that she's written two outstanding YA novels. I can't wait to read her next book. I have been wanting to read a book from Rainbow Rowell and I actually have Fangirl on my shelf. I like the sounds of this one, I might have to start with it. :) Great review. I think what I liked best about the book was that they're so normal. I teach them. I grew up with them. They're everywhere and yet their story was so sweet and poignant. Great review (it is always hard for me to review an over-hyped book, too). I LOVED this book and it had me in tears near the end. I still have to read Fangirl but now I *get* why people like Rowell's books so much. As much as I loved Fangirl, I'm a little scared for this book.. I want to love it so badly but I'm afraid I won't. Still, your review gives me hope! I myself really enjoyed this book. I didn't think I would.. since I am not a contemporary reader of YA but this is not that at all. It has a very neat different story. One that I don't relate to in my life.. but I felt like I did anyways because of the writing. Rowell is an outstanding writer! I absolutely love this book. I have fangirl on my tbr pile as well. I'm hoping there is a sequel to this one. I would love to know what happens next. I'm glad you liked the book! I've never read this or anything from the author, but I know I should since everybody loves her work!